Computer guided implantology by the dentist at Woodbury Dental and Laser Clinic refers to the use of 3D technology in the planning, as well as the placement of dental implants. This technology enables the dentist to be guided in the most precise way during the treatment planning stage for the patient’s implant needs, and can also eliminate any unwanted surprises or obstacles that may be present – during the actual placement of the dental implants. Computer guided implantology by Surgicase gives the dentist at Woodbury Dental and Laser Clinic the power to accurately predict the treatment outcome – avoiding unnecessary obstacles throughout the duration of the implant placement, and afterwards. The 3D technology ensures that the planned outcome will be the actual result after the computer guided implantology – and ensuring that the patient will get the result he or she wants. What is Involved in Computer Guided Technology with SurgiCase? Computer guided implantology with SurgiCase uses state of the art 3D technology, which guarantees precise dental implant treatment planning and placement – a significant additional value to implant treatment. The concept of the SurgiCase computer guided technology by the dentist at Woodbury Dental and Laser Clinic includes the use of SurgiCase software, as well as SurgiGuides. The SurgiCase software enables the dentist at Woodbury Dental and Laser Clinic to be fully and carefully prepared – even before the actual dental implant surgery. A treatment plan for the computer guided implantology is precisely created for the ideal positioning of the implants, with the treatment plan rendered in both 2D and 3D; the planning will also take into account the patient’s aesthetical, as well as clinical, considerations. The computer guided technology by SurgiCase makes it easier for the dentist at Woodbury Dental and Laser Clinic to clearly visualise the plan for the placement of the dental implants. 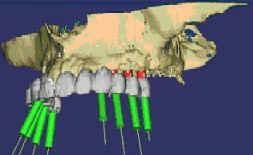 The 3D technology used in SurgiCase software is created to encourage communication between the individuals that are involved in the actual dental implant treatment, and will easily provide the involved dental professionals with the information on where the dental implants should precisely be positioned during the actual surgery. The Kent dentist or surgeon, as well as the patient, will both be better prepared for the actual placement of the dental implants. The patient and the dentist will know exactly what to expect from the surgery, since the accuracy level of the implantology procedure is extremely high. The length of time for the actual placement of the dental implants is decreased, since the 3D technology has already given a clear visualisation of where the implants should precisely be placed. There is no need to spend a long period of time during the actual dental implant surgery with the assistance of the SurgiCase software. 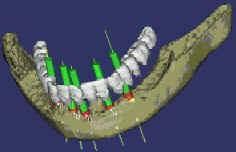 In addition, the high precision regarding the location where the dental implants should be placed eliminates greatly reduces the margin for error – and again, makes the length of time of the actual surgery a lot shorter (compared to doing the procedure without the aid of the SurgiCase software technology). Computer guided implantology by a Kent dentist increases the confidence of both the patient and the dentist, since the 3D technology used to plan the actual dental implant placement provides a clear visualisation of the entire procedure. The safety of both the dental implant patient, and the dental surgeon who will do the procedure, are guaranteed – again, mainly because of the accuracy of the entire dental implant placement/treatment planning. The costs involved in the computer guided implantology by SurgiCase are accurately determined beforehand, so there are no surprises when it comes to the total costs even after the dental implant surgery has been finished. The fees will be easy to predict even during the treatment planning stage, eliminating unwanted and additional costs that can pose unnecessary challenges for the patients after the dental implant treatment. The careful and precise planning of the computer guided implantology by SurgiCase can eliminate the need for a bone graft – provided that the accurate 3D images show that the patient has sufficient jaw bone mass where the dental implants need to be placed. Complicated and costly bone grafting procedures (which can also add to the total treatment time) can be eliminated when the SurgiCase software determines that there is no need for bone augmentation.